When Bill Viola talks about his art, he refers to it as ‘our work’. He and his wife, Kira Perov, have been working together since they met in Melbourne, Australia, in 1977. The first thing Viola tells me, when I sit down with him at his studio in Long Beach, California, is that it is most important that my interview include Kira. In 1977, Viola (b. 1951) was only four years out of his undergraduate degree at Syracuse University, but he was already a fast rising star in the still nascent genre of video art. Early adopters, in the late 1960s, of the new Sony Portapak technology (which allowed a cameraman to record without being tethered to a mains video deck) included Nam June Paik and Peter Campus, both major influences on Viola. The younger artist distinguished himself, however, with meditative, mystical compositions that had more in common with still life painting or religious icons than with contemporary media studies and the fields of experimental film and performance that informed the work of his predecessors. That may explain why Viola was content to live and work not on some remote desert ranch, but in the industrial harbour town of Long Beach, half an hour south of Los Angeles. In the charmless business park where his studio is located, oil derricks nod balefully in empty lots beside the road. ‘I don’t like big crowds,’ he says. ‘I don’t want to be in the middle of things. I want to be by the sea, or at least where there’s water. There’s a nice marina here.’ He keeps a low profile within the Los Angeles art scene. Does he even consider himself a Californian artist? ‘I really don’t know,’ he answers. In their early years together, Perov jokes, Bill would simply tell her, ‘you carry the Portapak and I’ll do the camerawork and just make sure you record some sound!’ Today she bears the formal title of Executive Director of Bill Viola Studio, but, she tells me, ‘normally I just say “partner and collaborator”’. Her diverse roles include running the studio, managing Bill’s often logistically grandiose productions, overseeing publications and coordinating exhibitions. She is even credited as a co-curator, alongside Jérôme Neutres, of the major retrospective that opens at the Grand Palais, Paris, on March 5th. There is seemingly no part of Viola’s art in which she does not have a hand. Nevertheless, she says, ‘in terms of the work, it’s Bill’s work. I’m kind of like a midwife.’ He nods in agreement. There is a wealth of precedents in which male artists have latterly credited their partners as collaborators – Ilya and Emilia Kabakov, Christo and Jeanne-Claude, Ed and Nancy Kienholz, Claes Oldenburg and Coosje van Bruggen, to name but a few. Viola and Perov, however, are as yet unprepared to share equal billing. Nevertheless, ‘I actually influence which works get made and don’t get made,’ Perov says. ‘And very often I’m a creative influence as well.’ She cites the example of their forthcoming four screen video project Martyrs, for Saint Paul’s Cathedral, London, which will be unveiled after long delays in May. ‘Bill had these wonderful drawings from a while ago, as part of the proposal, and I knew that we needed to get the production started as we didn’t have a lot of time. Bill was preoccupied with other stuff he was doing, and I started working on it, and thinking about it. Just from the drawings I was trying to imagine how they would come to life as video.’ Perov hit upon the idea of combining Viola’s drawings of four martyrs with the elements of earth, air, fire and water. Viola has used elemental motifs in his work many times before. In The Messenger, a video installation created for Durham Cathedral in 1996, a naked figure floats up through blue-black water, gasps for air as he breaks the surface, and sinks back down. That same year Viola created The Crossing, in which a man is engulfed by flames licking up from below and, on the other side of a freestanding screen, is obliterated by a deluge of water falling from above. The pieces are typical of the artist’s reduced aesthetic vocabulary, through which he creates tightly controlled images that aspire to capture certain essential qualities of universal, existential experience. Viola likes to refer to ‘the Zen doctrine of no mind.’ Japanese Samurai, who fought with some of the sharpest swords ever made, knew that to pause to think in mid-battle would mean instant death. Instead of reacting with what Viola calls the ‘talkative mind’, a Samurai would think with his gut. This philosophy, says the artist, ‘leaves you open to whatever’s happening, wherever you are.’ It does not seem to be a highly self-critical way of working, for an artist. That is not to say that it is inauthentic, or self-deceiving; merely that for the artist to obey his own instincts and desires above all else is to be remarkably untroubled by one’s own potential ever to be misguided, repetitious, derivative, or just plain wrong. When I ask Viola if he is a visionary artist, he answers without hesitation. ‘Yes. It’s all about vision. Inner vision. I don’t typically work from the outside world.’ Images ‘pop’ into his brain at the moments he least expects, such as when he is sitting down at his desk with a cup of tea. Sometimes, as with his recurrent use of submerged figures, they draw on experiences that are lodged in his subconscious, such as the time when, as a child, he nearly drowned in a lake. ‘Basically, these are pieces that I have been with for a long, long time,’ he says. This is why, ultimately, Bill is the source of these works, why it is his name on the catalogues and the exhibition posters, and why Kira is designated only as the ‘midwife’. It is clear, too, that artworks come to Viola in a wide variety of ways, not only from his unconscious. He is deeply influenced by devotional art, especially Christian painting from the Renaissance. Perhaps his most ambitious production to date was the five-screen installation Going Forth By Day (2002), which was commissioned for the Deutsche Guggenheim, Berlin. One of the five videos, titled The Voyage, was a faithful reconstruction (on a sound stage) of a house copied from Giotto’s frescos for the Scrovegni Chapel in Padua. Inside the house, an elderly man lies dying in bed while his son and daughter-in-law look on. Meanwhile, on the shore of a lake outside, his possessions are being loaded onto a barge, which soon he too boards and sets sail across the water. The allegorical piece was conceived while Viola was still mourning the passing of his father. beginning or end, in this world and the next.’ Viola’s piece involved the creation, in his Long Beach studio, of a flawless curtain of falling water, which was so transparent that only when a body touched it did the glassy water explode into a cascade of droplets. On three large plasma monitors, a succession of people including Viola’s son Blake advance out of darkness towards the viewer, filmed in grainy black and white by an ancient surveillance camera bought by the artist at a swap-meet. As they pierce the hitherto invisible wall of water, their images seamlessly transition into high definition, full colour. In order to achieve this effect, Viola’s team was aided by technicians from James Cameron’s Los Angeles production studio. Viola claims to be uninterested in Hollywood, and insists that the reason he moved to the region was for its incredible landscapes rather than the dominant local industry. That said, it has been useful to have such a wealth of technical expertise on his doorstep. Another video within Going Forth By Day was titled The Deluge. In it, the façade of a house is dramatically flooded from within, causing stuntmen to be swept down the stairs and through its open front door. Viola shot the video in the car park of nearby Long Beach airport, with a gigantic tank and pump system specially built by the local company Rain for Rent. Stuntmen aside, Perov says, she tends not to hire movie or television actors, preferring instead to work with theatre companies and performance artists. Even in works such as The Quintet of the Astonished (2000), in which five actors assume a sequence of emotional expressions from rapturous joy to despair, she says that, rather than act per se, ‘we asked them to look inside themselves.’ Many of Viola’s videos – including Ocean Without a Shore – depict protagonists undergoing genuine physiological experiences, such as walking through a wall of water or holding their breath for long periods of time. The exhibition, which brings together 20 of Viola’s most important works, will be divided into three sections, each themed around an existential question: ‘Who am I? Where am I? Where am I going?’ These questions were suggested by the curator Jérôme Neutres in response to the ‘journey’ through the work proposed by Perov. After The Reflecting Pool, visitors will walk through installations including Heaven and Earth (1992), in which footage of a dying woman is reflected in the face of a newborn baby, and Nine Attempts to Achieve Immortality (1996) in which Viola holds his breath, nine times, as long as he possibly can. In the section ‘Where am I?’ viewers find videos set in sublime locations such as a Tunisian dry salt lake in Chott el-Djerid (A Portrait in Light and Heat) (1979) or the dry lake bed El Mirage, in the Mojave Desert, in Encounters (2012). The question ‘Where am I going?’ is answered, unflinchingly, by the diptych Man Searching for Immortality/Woman Searching for Eternity (2013), which was recently exhibited at Blain Southern Gallery, London. On two black granite slabs, life-sized projections of an elderly man and woman show them passing torches over their naked, aging bodies. Finally, their images turn grey, and they pixelate and dissolve into the granite: dust to dust. 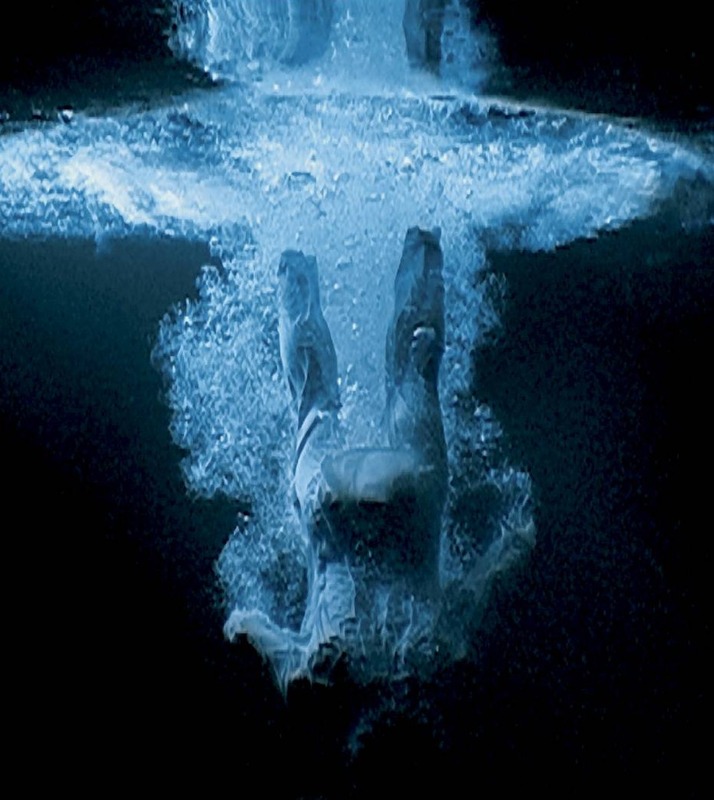 The show ends with Ascension (2000), a man who plunges, and slowly floats up, through blue-black water, and The Dreamers (2013), seven plasma screens showing people seemingly asleep underwater, lying on a riverbed.